GelTech Solutions, Inc. (OTCBB: GLTC), creators of Soil2O Dust Control, a cost effective, environmentally friendly solution to airborne dust, and FireIce, a revolutionary water enhancing fire suppressant that has the potential to change current firefighting techniques globally, announces that Peter Cordani, GelTech’s Chief Technology Officer, recently spent four days in Colombia working with a large private international mining company to help them mitigate dust from the haul roads. GelTech’s Soil2O Dust Control product was chosen over two other competing products in side by side testing. FireIce is a patent pending fire suppressant used for direct attack of fires as well as a medium term retardant for structure protection. FireIce can be used in all types of apparatus; fire extinguishers, pumper trucks, aerial units for wildfires and home defense units for personal home protection. GelTech also markets Soil2O which is both a non-toxic soil conditioner and a dust abatement product. Soil2O “Dust Control” products and solutions stop all types of particulate matter from entering the air and water, solving even the most stubborn dust control problems. 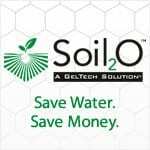 Soil2O Granular and Topical blends reduce water consumption up to 50% and promote healthy root development in plants and lawns, generating faster seed germination by keeping nutrients and moisture at the root level longer.